With the school closing for summer vacation for the boys and annual exams beginning for Konda, it has left us worried about how Konda will prepare for her exams with the boys running around non stop. It’s just couple of days since their vacation and they are already not sure what to do with their time. This weekend we again planned for a morning swim and then for the Holi celebrations at the club. The kids were going on and on about going for the celebrations on time. And they won’t just let me sit or do anything without reminding about the Holi. While Chinnu was saying it was Poli, and even remembered the time they fed the deer en route to Tirupati, he was telling that to his cousins, that we are going for the Poli celebrations. I had to correct him saying it wasn’t Poli but Holi. Peddu, the ever questioner, came up asking what Holi was. I said he can wait for couple of hours by which time he will know it for himself. We landed at the venue to see the celebrations were on way. People were colourfully decked with pink, green and yellow. We did a customary splash of colours on ourselves. The kids tried sitting at one spot for a while, getting highly motivated to join the group of kids playing in the water. Soon they were given the water guns and it was the beginning. All three enjoyed their stunt in the water, shooting at the other kids, mindless of the sun looking down at us. It was quite hot! Finally after much persuasion, we got them to get changed and sit for lunch. It was an interesting menu with Palak Puri, Masala Puri with Aloo Muttar Tamatar finished with Jalabi. I stood watching the chef swing his hands in expertise, swirling the rings in hot oil, quickly removing them to dip in sugar syrup. I asked him how he made, he was smart enough not to reveal the recipe. Well, so much for asking! We came back home for an afternoon siesta, which naturally I didn’t take. Coming to the recipe for today, this is a strange combination of Paneer and Chicken garnished with Cheese that goes so well as a starter for dinner parties. Amma makes it and I got to see how she makes it. Since hubby dear is not a person who will mix paneer with chicken, the verdict came from Dad that it was very delicious. Wash and cut chicken into bite size pieces. Marinate it with Turmeric powder, lemon juice for 1/2 hr. Heat a non stick pan, add oil, saute ginger garlic paste, followed by onion paste, Fry for couple minutes. Then add cubed capsicum pieces, fry for a while till the capsicum softens a bit. Next add the tomato puree, fry for a minute. Once this is done, add chicken marinade, fry well. Add chili powder, 1 cup water, bring to boil. Then simmer for 4 mins for the chicken to get cooked well. 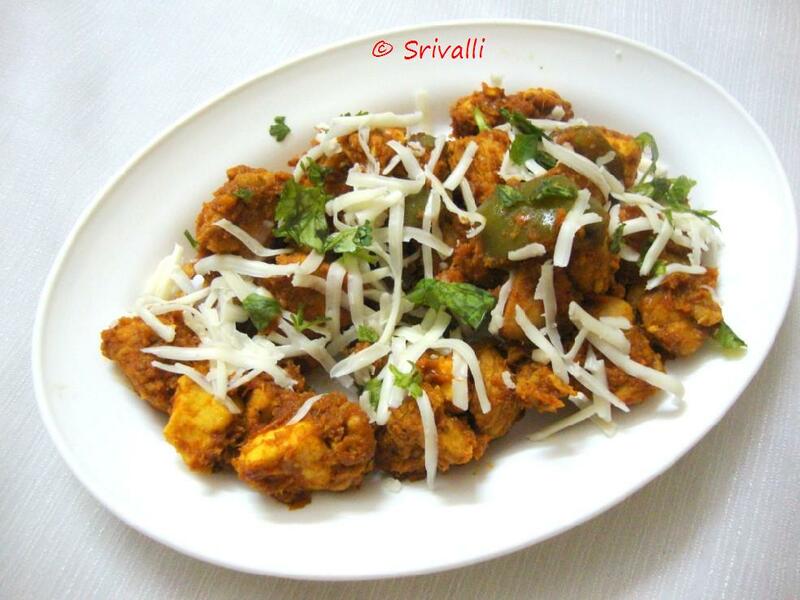 Once chicken is cooked, add paneer cubes, garam masala, fry for few mins. Just before taking the dish off, garnish with grated cheese and finely coriander leaves. If you wish for the cheese to mix in, saute it, else you can serve as such. This is served as a dry dish, looks more like chili chicken or chicken 65 with masalas coating the pieces. Paneer can be fried before adding, but I haven’t done it here. Cheese can be allowed to melt if you like it spread. But since I didn’t add mozzarella cheese, it didn’t spread. For me, making chicken was never an issue but making it with paneer and not eating it, was..:) anyway was happy seeing Dad enjoying it. paneer n chicken on the same plate…too delicious!!tempting! Interesting combo..should try it some day…my hubby is an ardent paneer lover..he's gonna roll his eyes if I mix paneer with chicken! Never tried out paneer and chicken together,quite an interesting dish..
Something new..kids will love it. Wow looks so tempting and very interesting recipe it !!! Never had this combo before..sounds delicious and yummy! thanks for the recipe! 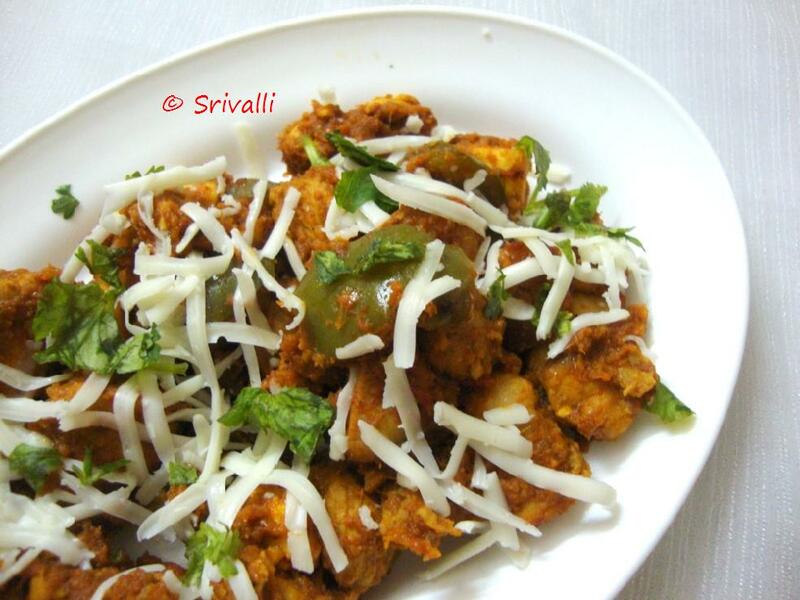 Lovely paneer chicken…enjoy the holidays.